Code should be easy to understand. Code should be written to minimize the time it would take for someone else to read it. Pack information into your names. It’s better to be clear and concise than to be cute. Booleans - isX, hasY, canZ, shouldP – don’t use negated names, e.g. disable_ssl. Consistent style is more important than the “right” style. Match existing style! The purpose of commenting is to help the reader know as much as the writer did. Don’t comment on facts that can be derived quickly from the code itself. Instead of minimizing the number of lines, a better metric is to minimize the time needed to understand it. Look at code from a fresh perspective when you’re making changes. Step back and look at is as a whole. Break down your giant expressions into more digestible pieces. Beware of clever nuggets of code – they’re often confusing when others read the code later. Make variables visible for as few lines of code as possible. The more places a arable is manipulated, the harder it is to reason about its current value. 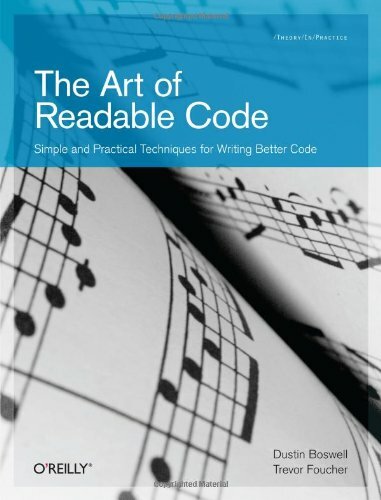 The most readable code is NO CODE AT ALL. Test code should be readable so that other coders are comfortable changing or adding tests. You should pick the simplest set of inputs that completely exercise code. Prefer clean and simple test values that still get the job done. These are merely the notes I took. They are not meant to represent anything more than that. I highly recommend you read the book, it’s really good.